The SCC fared well at the 84th New England Cross Country Championships, held at a muddy and blustery Derryfield Park in Manchester, NH on Saturday, Nov. 10. SCC, Class LL and State Open champion Xavier ran a great race, finishing third (out of 30 teams) in the final team rankings (111) behind two schools from Rhode Island, champion LaSalle Academy (49) and runner-up Bishop Henricken (80). Leading the way for Xavier were junior Robbie Cozean (16:14) and senior Dillon Selfors (16:15), who finished 11th and 12th, respectively, on the 3.1 mile course. 258 runners competed in the race. Senior Connor Visnic (Amity Regional) finished 23rd (16:31) to earn All-New England honors along with Cozean and Selfors. Xavier senior Peter Schulton finished 26th (16:33) while classmate Will Curran finished 39th (16:46). Wilbur Cross senior Travis Martin finished 43rd (16:47), while 2018 SCC champion Robert Dillon (Shelton) placed 45th (16:48). Xavier freshman Eamon Burke finished 68th (17:04), while Cheshire junior Brendan Mellitt was 83rd (17:13). In the girls race, 2018 SCC champion (and Class L runner-up) Meredith Bloss, a senior from Guilford, finished 33rd (out of 261 runners) with a time of 19:44. 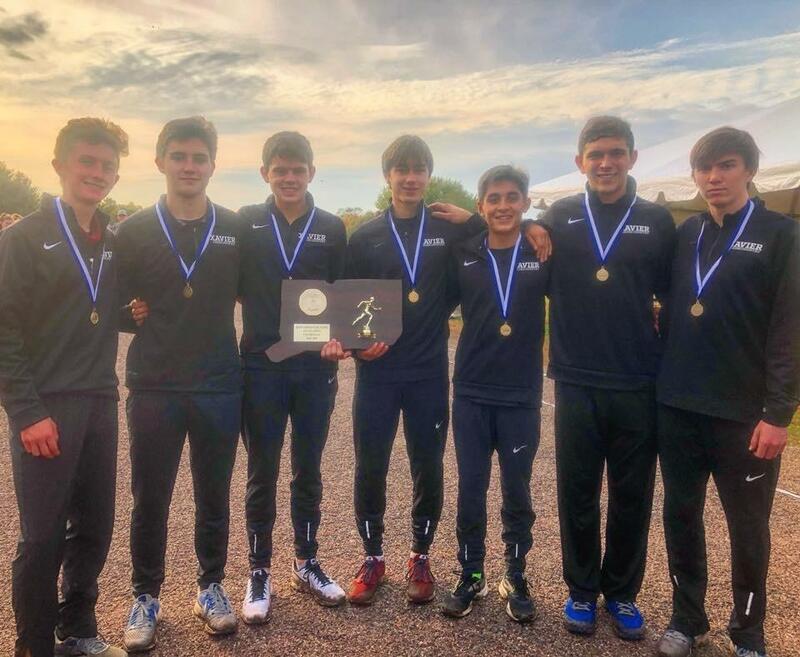 Xavier added to its Class L state boys cross country championship with the State Open title on Nov. 1 at Wickham Park. The Falcons will now seek to defend its New England Championship title next weekend in New Hampshire. It is the sixth time in SCC history that a school won both the class and state open titles in the same year. Xavier has done it four times (2018, 2009, 1999 and 1995), while Fairfield Prep (1997) and Guilford (2004) had done it once. The Falcons placed four runners in the top 14 to cruise to victory with 75 points, 46 better than runner-up Hall. SCC teams Shelton (10th), Wilbur Cross (11th) and Amity Regional (14th) fared well. In all, nine runners from the SCC finished in the top 20 of the boys race. Individually, Xavier junior Robbie Cozean finshed third (16:11), followed by teammate Peter Schulten (5th, 16:16), Fairfield Prep's Azaan Dawson (7th, 16:20). Xavier's Dillon Selfors was ninth (16:27), while Wilbur Cross' Travis Martin was 10th (16:27) and Shelton's Robert Dillon (12th, 16:33). Xavier's Will Curran was 14th (16:36), Cheshire's Brendan Mellitt (15th, 16:36) and Amity Regional's Connor Visnic (19th, 16:38) all qualfied for the the New England XC Championships, which will be held on Saturday, Nov. 10 at Derryfield Park in Manchester, New Hampshire. SCC Champion Xavier won the Class L State Championship on Oct. 26 at Wickham Park. The Falcons placed five of its runners in the top 12 - all earned All-State honors for their efforts. Xavier's 26 points, easily outdistanced runner-up Bristol Central (80). Robbie Cozean (2nd, 16:06), Peter Schulton (3rd, 16:14), William Curran (4th, 16:19) and Dillon Selfors (5th, 16:21) led the way while Eamon Burke came in 12th (16:52). In Class LL, Shelton's Robert Dillon, the 2018 SCC champion, placed third (16:00) to lead the Gaels to a 4th place finish, while Wilbur Cross was 5th, led by Travis Martin (5th, 16:16). In Class MM, Guilford finished 5th overall. Xavier won its third consecutive SCC boys cross country title. Shelton was the runner-up. It is Xavier’s 12th overall league title. Fairfield Prep senior Drew Thompson finished in eight place at the Foot Locker Cross Country National Championships on Dec. 9 at Balboa Park in San Diego. Thompson finished the three-mile race in 15:43.7. He was the only male runner from the state participating. The champion was Dylan Jacobs of Illinois in 15:19.7. Last year, Thompson finished 35th on the same course in 15:52.2. Thompson won the SCC, Class LL, State Open and New England championship meets this season. He is a three-time SCC champion - the only runner in league history to achieve the feat. Xavier captured the 2017 SCC Boys Cross Country Championship, held on Thursday, October 19 at New Haven's East Shore Park. It was the Falcons' second straight SCC title, and 11th overall since 1994. It is the 11th SCC title for Xavier (and 2nd straight). The 2015 SCC Boys Cross Country Championship Meet was held on Thursday, Oct. 22 in Madison at Hammonasset State Park.